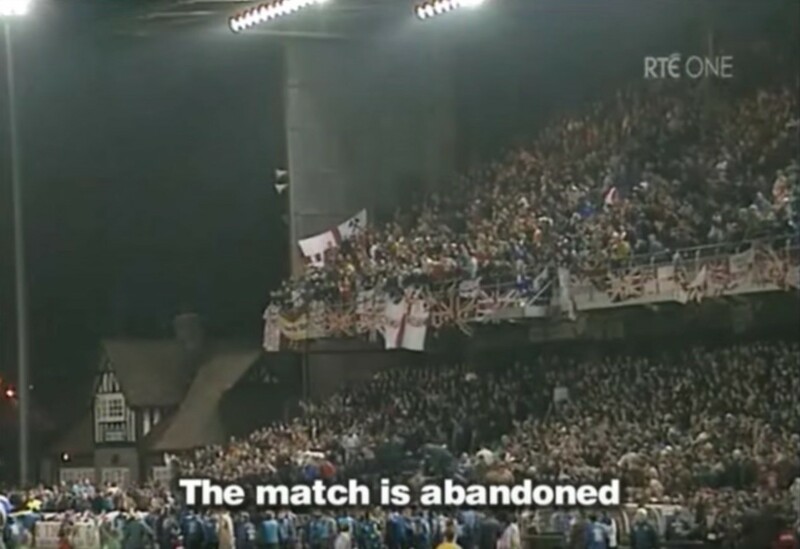 On 15 February 1995, a riot erupted at a friendly between Ireland and England in Dublin. A subsequent report laid the blame on English supporters and Irish authorities. The supporters in question were members of Combat 18, an English neo-Nazi white supremacist group with a history of violence including football hooliganism. They wasted little time in turning the friendly ugly, chanting “sieg heil” and giving Nazi salutes during the playing of the national anthems. The violence escalated, with rioting in the stands as the referee decided to cancel the remainder of the match. Most fans were evacuated, but those that remained clashed with police. A total of 50 people were injured. Afterward, an inquiry found the English supporters, and Combat 18 in particular, responsible for the outbreak of violence. But the Irish authorities also shared some of the blame. They had been alerted before the match to the presence of Combat 18, but failed to take action (and even declined assistance offered by their English counterparts). Who said it: Jose Mourinho or the young pope?